Drops in profits in two quarters this year have not dimmed Sabic’s optimism about growing its portfolio and retaining its commanding position as a global petrochemicals and plastics player. The company is pursuing manufacturing projects and has scored in the innovation field, coming out with useful products that enjoy demand across the world. Most recently, Sabic and the Korean petrochemical company, SK Global Chemical, concluded negotiations for a 50-50 joint venture that will purchase the unique Nexlene solution technology and a plant that manufactures a range of high-performance ethylene/alpha-olefin copolymers in Ulsan. The aggregate purchase price for the technology and plant is approximately $640 million. The plant has annual capacity of 230,000 tonnes and the JV parties intend to have more capacity through new units globally. Yousef Al-Benyan, Sabic’s acting vice chairman and CEO, said the partnership was the latest stage in Sabic’s global expansion. “By growing our presence in the Republic of Korea we are opening up new markets globally and reinforcing our position as a global leader – a major goal of our 2025 strategy,” he stressed. Abdulrahman Al-Fageeh, executive vice president for polymers, said the new venture would enable both partners to grow in the highly specialised polyethylene market by providing high-value polymer products to global customers. “The solidification of our partnership with SK Global Chemical will complement our polymers portfolio and enable us to offer a more varied, cost-effective, and customer-focused selection of products,” he said. 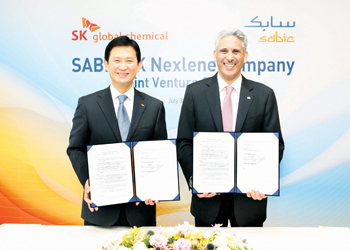 The joint venture holding company, Sabic SK Nexlene Company, is headquartered in Singapore and wholly owned subsidiary, Korea Nexlene Company (KNC), owns the plant in Ulsan. Earlier this year, Sabic signed a JV with Molecular Rebar Design to develop and commercialise nanomaterials for select market segments and applications. The new firm, Black Diamond Structures, will utilise the US company’s unique carbon nanotube technology, Molecular Rebar. The new company will focus on such market segments as energy storage, energy generation, automotive and light truck consumer electronics and construction. And, at its carbon dioxide utilisation plant in Jubail, hailed as the world’s largest, Sabic is making preparations to begin commercial operations. Commissioning is in progress prior to the official opening. Sabic is using new technology at the plant in which it will compress around 1,500 tonnes of raw carbon dioxide daily from glycol plants which will then be piped to make urea and methanol. A German company built the facility and Sabic has the all-important patents. The unit will achieve full operation by the time the company’s new 500,000 tonnes per year ethylene glycol plant in Jubail comes online by year’s end. The petrochemical giant will raise its utilisation of carbon dioxide, a feed stock in chemicals production, to 4.2 million tonnes annually in the next two years from 2.7 million tonnes now. In the future, the CO2 will figure in another role. Sabic’s manufacturing affiliate Gas will purify some of the carbon dioxide to create industrial-grade material for the food and beverage industry. The latest utilisation CO2 plant is an example of Sabic’s keenness to reduce greenhouse gas emissions, the company said. Sabic plans to add 30 per cent production capacity to its Ultem-brand polyetherimide resin, which is enjoying unprecedented demand globally. The company is also adding a new polycarbonate production line at the Chinese plant it operates in a joint venture with the Chinese firm Sinopec. Sabic is also in the process of adding a new ABS line in Saudi Arabia, which will increase production capacity by 80 per cent. Sabic has a strong R&D policy and the company has been quite prolific over the years in introducing innovative products. It was announced that its certified renewable polyethylene will be used as coating for beverage cartons following a partnership with the liquid food packaging firm Elopak. Sabic’s renewable, second-generation PE and polypropylene are certified under the ISCC Plus certification scheme and made to the same high specification as existing PE and PP production. Also recently the company launched for aircraft interiors its Lexan XHR Light sheet in two grades that comply with industry heat release, flame and smoke regulations. The advantage of the new grades, XHRL300 and XHRL200 are that they open further opportunities for design flexibility and weight savings. “Sabic understands the need for its aircraft interior customers to not only stay ahead of design trends but also meet demand for lighter weight aircraft interior components that can help improve the overall fuel efficiency of the aircraft, said Kim Choate, Sabic’s market director, mass transportation, Innovative Plastics. Sabic’s superior optical quality polycarbonate Lexan was used in making Isoclima’s CromaLite brand of SPD-Smart electronically dimmable windows. The SPD-Smart EDW film technology came from Research Frontiers. Earlier this year, the company launched a new range of non-phthalate polymer products developed at its Riyadh technology centre. These products will help fulfill customer demand for advanced solutions in segments such as hygiene fabrics and flexible packaging. The company has delved into additive manufacturing. It unveiled a 3D printed roof design for heavy-duty vehicles to enhance fuel economy. Sabic was also part of the Big Area Additive Manufacturing (BAAM) printer project which yielded the 3D printed Strati car. It has worked on several other 3D printing projects. 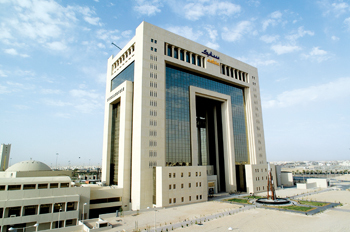 Sabic’s achievements in launching promising projects and innovations help it to stay confident despite profit setbacks which it sees as wholly beyond its control. The company reported a Q2 net profit of SR6.17 billion ($1.64 billion), down from SR6.46 billion in the year earlier and its revenue also fell 5.7 per cent to SR2.64 billion. However it exceeded most analysts’ expectations. The company had posted a 39 per cent fall in Q1 net profit compared to a year earlier to SR3.93 billion, beating analysts’ expectations of a steeper decline in earnings. A diversified portfolio and a global presence has helped in cushioning the fall while a more efficient management of its plant operations has also helped.